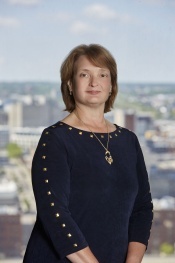 Laurie A. Petersen Business Immigration Lawyer in Milwaukee | Lindner & Marsack, S.C.
Laurie A. Petersen is a shareholder and member of Lindner & Marsack, S.C.'s Board of Directors. Her labor and employment law experience covers a broad spectrum of matters for diverse business organizations in a range of industries. Her partnership with a variety of organizations involving a range of issues has prepared her to understand and support her client's business by counseling a strategy that fits the client's goals and philosophy. at Marquette University Law School where she teaches employment discrimination law. She also has presented live seminars and webinars on business immigration; health and safety; employment discrimination and affirmative action.